xVicesAndVirtues wrote: Hey guys, I have a question for the die-hard Holiday Park enthusiasts out there. I'm sure this has been answered before somewhere and tried doing some searches to no avail. Why exactly does Expedition GeForce run with the second-generation Intamin front zero car and front car, then the rest of the train with first-gen Intamin train cars? Interesting. I've never been to Holiday Park, but I believe the coaster is like that because it was built in 2001. It was built after the first-generation hypers at SFNE, SFA, and DL (1999-2000), but before the second-generation ones like Goliath and Thunder Dolphin (2002-2003). ^...but, if you look on rcdb, there are photos with it previously running a full first-gen train (with the first-gen lead car), then at some point later, they switched out just that lead car. I think it depends from a coaster to coaster basis. Superman at SFNE previously ran with a first-gen lead car too, but it was upgraded when they got new trains. Ride of Steel at Darien Lake got a new train this year, and it is completely modeled like the first generation style. Of course both EGF and Superman have much larger and more twisted layouts, which may contribute to the decision. Although Ride of Steel's train is designed like a first generation model, all of the electronic and mechanical components have been upgraded. xVicesAndVirtues wrote: ^...but, if you look on rcdb, there are photos with it previously running a full first-gen train (with the first-gen lead car), then at some point later, they switched out just that lead car. Nice catch; I didn't notice that. Like coasterkid124 said, it's probably a coaster to coaster basis. I always assumed EGF had the newer model trains (Goliath, Thunder Dolphin), but I love finding quirky things like this about coasters. Interesting stuff. Superman/Bizarro/Superman again at SFNE ran a full first-gen train until they got the second-gen trains for the Bizarro transformation, which they kept and just lightly modified for the return of Superman this year. To the best of my knowledge and what I can find from searching and looking through photos online, EGF is the only case of the mixed train. Having rode both EGF about two months ago, then Superman a few days ago, I can definitely say that Superman's train feels uniquely "light" while riding and kind of seems to jog and bump up a bit going over the larger hills. EGF does not feel this way. I rode EGF in front row a couple of times and did not get a similar sensation. But at the same time, maybe EGF's heavier first-gen train pushing the lead car prevents this sensation from taking place. Maybe the fact that the second-gen lead car also includes a very small "zero car" on the front (that shares a wheel assembly with the 1 car) that can flex a bit improves the tracking on a more twisted layout like EGF, or maybe helps with maintenance/wear and tear a bit? Purely speculating, also purely speculating about the second-gen being lighter, but thats the way they seem to feel with the way they track. xVicesAndVirtues wrote: Maybe the fact that the second-gen lead car also includes a very small "zero car" on the front (that shares a wheel assembly with the 1 car) that can flex a bit improves the tracking on a more twisted layout like EGF, or maybe helps with maintenance/wear and tear a bit? The original front cars were no good for the twisty track. They actually got damaged. Finally got to go to Holiday Park a couple of days ago and must say that Expedition GeForce is hands down the best coaster I've ridden in Europe by a long way. What a brilliant ride! Next year the Holly's Wilde Autofahrt roller coaster will disappear from Holiday Park. In replacement the park will open a big new attraction in 2018. 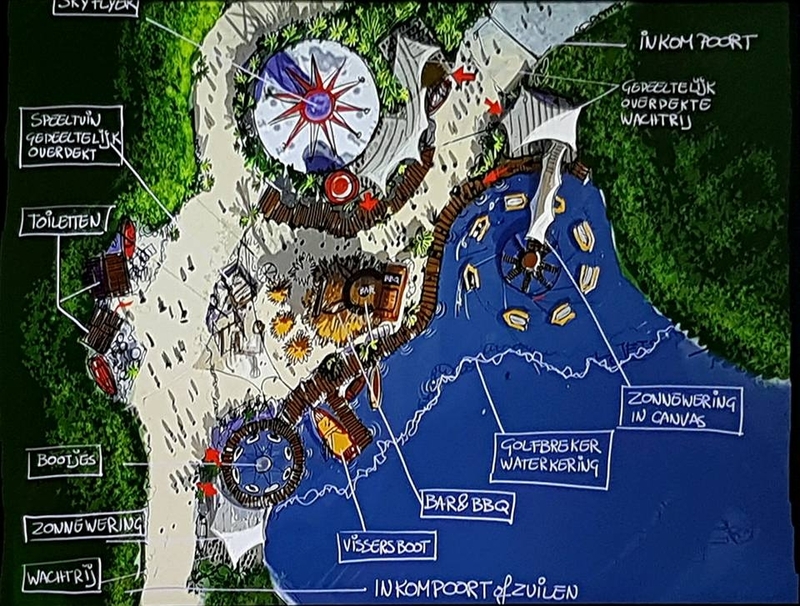 Next to the Light House Tower, there will open a new beach area (Holiday Beach Club) with three new attractions: a jet-type, boat carousel and playground.